COLLINSVILLE grazier Jim Hillier (pictured) knows a thing or two about landscape remediation – he has spent his whole life working with soil, as a grazier, and as a machine operator. “Some people think that because you push dirt around you’re an ignorant and destructive bugger who’s out to ruin the environment, but that’s not close to the truth,” Jim said. “I’m a greenie. I don’t like erosion, I want to keep soil on my land, and I want to see pasture in the paddocks all year round to feed my cattle. “What I have done is used mechanical intervention to help improve the condition of my land. 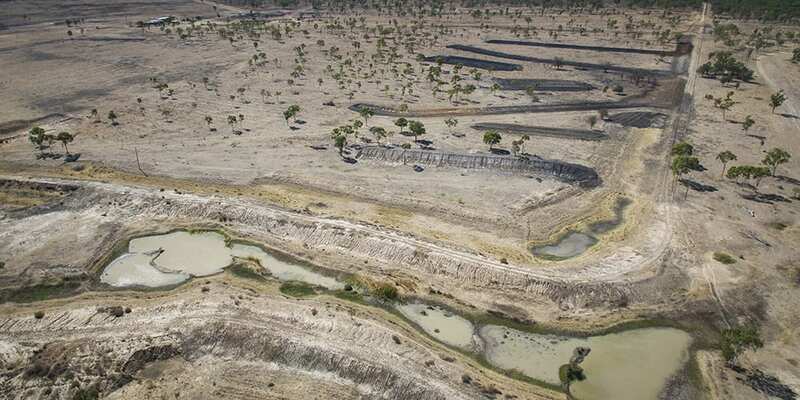 “I’ve reshaped a few small gullies, installed several dams and put in a series of diversion banks, and this keeps both soil and water on my property,” he said. GRAZIERS always seem to pay attention when another grazier is sharing his or her real-world experience. An important component of LDC is to foster peer groups in the BBB catchment that are self-directed, and are supported by extension staff, to help deliver skills and knowledge. To be successful, peer groups require openness, mutual respect for one another’s ideas, opinions and suggestions, and confidentiality, even if members don’t always agree. In a peer group everything gets shared — what works, what doesn’t and why. Trust is key. If you’re going to get the secret sauce from other land managers, you have to be able to talk about just about anything in the group. There are a number of cluster groups that have come together to share ideas, including Jim Hillier from Glenmore, and his neighbours. Jim’s story is a good one and the remediation work that he has implemented on his property, along with a complementary grazing regime, is one worth sharing. As a result four cluster groups have been formed – two groups focused on erosion control activities, and two groups focused on grazing land management activities. This is a great example of how both the BBB Grazier Support and Landscape Remediation activity areas are working together to achieve productive outcomes for graziers. 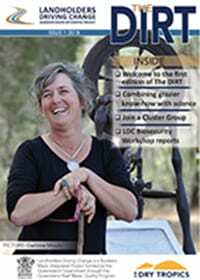 Graziers interested in joining a cluster group can contact a member of the LDC grazing team. Last year, Jim and wife Eileen were looking out over a drought affected landscape, wondering if they were going to see water in the dams anytime soon. In January, the heavens opened and dumped more than 300mls of rain across the property. That water stayed on Glenmore, and Jim is still grinning. 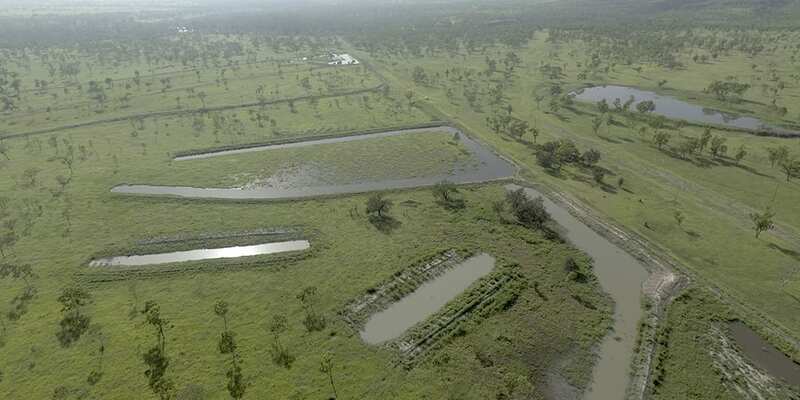 Glenmore is a 207ha property on the banks of the Bowen River, near Collinsville. When Jim took over management in 2003, the property had low ground cover, poor infiltration rates and low numbers of 3P (palatable, perennial, productive) pasture species. There were several large erosion gullies on the property. Jim began remediating these gullies through deep ripping along the contour, installing several dams and mechanical reshaping of manageable gullies. These remediation efforts did improve sediment loss, but during large rain events sheet erosion was occurring removing valuable topsoil. Through the Landholders Driving Change project, Jim was able to install sediment banks allowing for increased infiltration and sediment reduction. He designed the works himself with minimal input, showcasing his experience and technical expertise gathered from decades of experience and a deep trust in using a dumpy level. 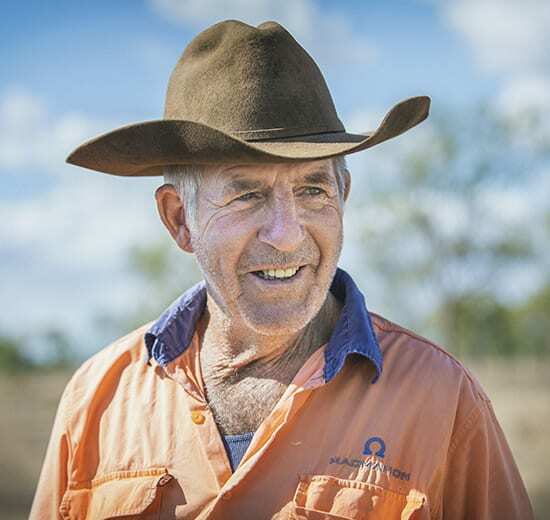 Jim is a strong advocate for sharing ideas and he opened his farm gates to neighbours allowing them to inspect the process, and gain an understanding of the intent of what he was trying to achieve – trap overland flow, stop sediment, improve land condition and create a drought reserve. “The only way we’re all going to improve our land condition is to learn from one another, and from experts who we trust,” Jim said. “I have learnt a lot from many people I have worked with over the years, people who have worked with machinery, and those who have lived and worked on the land all their lives, they all have a great deal of knowledge and skills,” he said. Following a number of visits to Glenmore, and several chats over the fence and at the local drinking hole, neighbouring properties have approached NQ Dry Tropics to get involved with the LDC project. Riverview, Glen Bowen, Johnny Cake and Strathalbyn have all expressed interest in similar projects and works are currently being designed. We look forward to bringing their stories to life during the next two years.